The torsion disc improves on conventional rubber disc isolation technology by using metal springs to absorb stress forces experienced during operation. Rubber discs can oxidise and eventually break, leading to possible damage to the drivetrain. Our torsion disc metal springs will outlast the rubber disc in other flail mowers. Unlike other Flail Mowers, our patent-pending staggered blade pattern significantly reduces the transfer of cyclical impact forces to the drivetrain. This reduces wear and tear on the entire drivetrain maximising its operational life. It also provides a smoother experience for the operator when mowing or cutting. Some Flail Mowers have only one flange with the other rotor assembly end exposed to dirt and debris. Others use smaller flanges, which also leave the rubber isolation discs exposed. 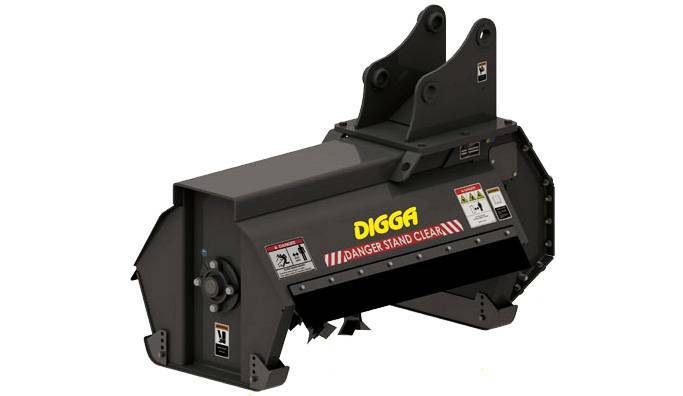 The Digga Flail Mower has a heavy duty flange on both ends of the rotor to protect the drivetrain and prevent wire from causing damage. Equipped with adjustable skid shoes that allow material to contact the blades without obstruction in either direction. Other Flail Mowers incorporate rollers useful for following the terrain but obstruct access to the blades. Material can also get caught in the roller. The blades on our Flail Mower come to a complete stop in 4-5 seconds when connected to the bi-directional circuit. Other Flail Mower blades can take up to 20-30 seconds to stop completely when shut down. This may pose a safety concern for the operator or bystanders. For pricing or more information about the Flail Mower fill out the form and we&apos;ll be in touch soon. Alternatively call (08) 9457 1544.